We enjoy working with graphic designers to create their designs in letterpress printed cards and inviations. 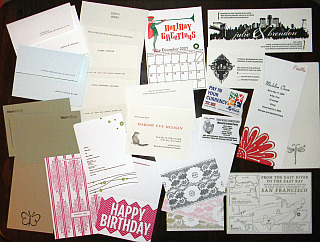 We specialize in custom printing run on commercial letterpress equipment in quantities of 100 to 100,000 pieces. Please review our portfolio of work, and contact us for a quote on printing your designs on your choice of papers and in your choice of colors.